When you create a new plugin, you could have noticed that a “locales” directory is created by the plug-in project wizard in the appmodel directory. This directory can contains the messages in different languages. 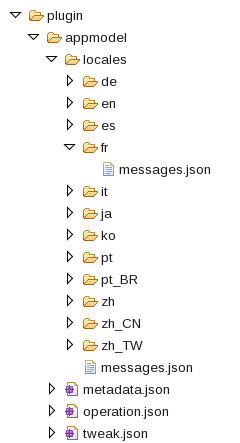 Here how it works.Here the structure of the appmodel directory: The messages.json in the locales directory is the default value to all message reference. This file is a JSON object of key/value pairs. The key will be the reference key for the message and the value the string to display. The messages.json files located in the sub-directories will be used depending on the browser settings (ie: fr, en, es,…. ).